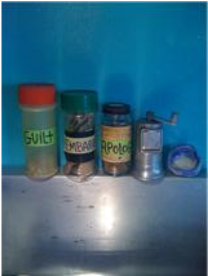 Here is a picture of the spice rack of a randomly selected cook. It is long on content, but seems to be short on organization. 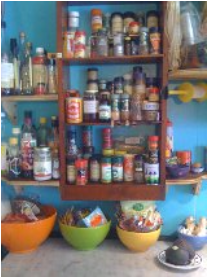 Here is a picture of the spice rack of a randomly selected non-cook. It is tidy, but there doesn't seem to be a whole lot there. The perspective of the non-cook has long been misunderstood and under-examined, if not for the most part completely ignored. First of all, it’s not simply that the non-cook doesn’t cook. In fact, many a non-cook finds herself, for better but mostly for worse, cooking much more than she would like. It’s not the doing or the not doing that marks the non-cook. It’s the being. Surely the being is worth attention! And an essential aspect of the being is the not wanting to cook. The state of not wanting to cook can be complex and multidimensional. There are factors, oh yes there are factors: Maybe your mom is a non-cook, or maybe she’s a mega cook; maybe you have five children, or maybe you live alone; maybe you’re sick of all consumption, weary of all responsibility, exhausted beyond belief --- maybe you’re occupied with other things that way, way trump cooking. Or maybe you’re a lazy so and so. Maybe you’re the type who forgets to eat, maybe you fear the interior of your refrigerator, maybe the kitchen is your Room 101. Or maybe your Room 101 is the grocery store. The why of the not wanting to cook situation varies from non-cook to non-cook. However, since the basic negative-on-cooking element is common to almost all non-cooks (except for those non-cooks who wish they were cooks, and we'll have to get to you guys a little later...) it is a good place to begin. We don’t want to cook!